What conditions does Reclast Bottle, Infusion treat? Tell your doctor right away if you have any serious side effects, including: increased or severe bone/joint/muscle pain, new or unusual hip/thigh/groin pain, jaw/ear pain, unusual weakness, eye problems (e.g., redness/itching/swelling, sensitivity to light), muscle spasms, numb/tingling skin, irregular heartbeat, sores in jaw/mouth. Get medical help right away if you have any serious side effects, including: signs of kidney problems (such as change in the amount of urine), seizures. 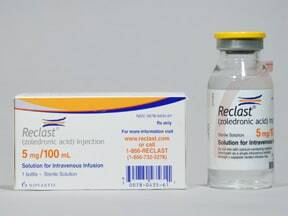 List Reclast Bottle, Infusion side effects by likelihood and severity. Before using this medication, tell your doctor or pharmacist your medical history, especially of: kidney problems, low calcium levels in the blood, problem taking calcium/vitamin D supplements, recent or planned dental surgery (e.g., tooth removal), certain gut problems (malabsorption, surgery on the small intestine), treatment with zoledronic acid (e.g., for cancer), parathyroid/thyroid problems (e.g., hypoparathyroidism, thyroid/parathyroid surgery), severe loss of body water (dehydration). This medication should not be used during pregnancy. It may harm an unborn baby. If you become pregnant or think you may be pregnant, tell your doctor right away. Consult your doctor for information on reliable forms of birth control. It is unknown if this medication passes into breast milk. Breast-feeding while using this drug is not recommended. Consult your doctor before breast-feeding. What should I know regarding pregnancy, nursing and administering Reclast Bottle, Infusion to children or the elderly? Some products that may interact with this drug include: calcium-containing IV fluids, mineral supplements (especially those containing calcium, magnesium, or phosphorus), "water pills" (diuretics such as bumetanide, furosemide). Also tell your doctor or pharmacist of drugs that may be harmful to your kidneys such as: aminoglycoside antibiotics (e.g., gentamicin, tobramycin), amphotericin B, nonsteroidal anti-inflammatory drugs (NSAIDs such as ibuprofen), tacrolimus. Does Reclast Bottle, Infusion interact with other medications? Are you taking Reclast Bottle, Infusion? Are you considering switching to Reclast Bottle, Infusion? How long have you been taking Reclast Bottle, Infusion?